All season the Mets have been thought of as solid team that is two or three bats away from seriously competing. Things changed last week with the promotion of Michael Conforto and Travis d’Arnaud’s return from a lengthy DL stint. The team all of a sudden looked like it could stay competitive against the big bad Nationals but things changed drastically when Sandy Alderson made the big trade that fans have been clamoring for when he traded top prospect Michael Fulmer and prospect Luis Cessa for Yoenis Cespedes. Cespedes has been great early on as a Met. The slugger has 5 RBI in 6 games since arriving in New York. He has been a great baserunner and has looked solid in both left field and centerfield. Perhaps most importantly pitchers now are being forced to throw fastballs to Lucas Duda who has torn the cover off the ball since the new lineup addition. The Mets are 6-0 since Cespedes joined the lineup. Cespedes, 29, will be a free agent this offseason and many have speculated that he could be looking for a contract around what Shin-Soo Choo got from the Rangers a few winters ago, 7 years, $130 million. Many have speculated that with a strong finish that Cespedes can prove that he is a franchise player, capable of carrying a team to the playoffs. If that happens expect the Cuban outfielder to get even more than the $130M. Even if the Mets were willing to pay that contract Cespedes has a unique clause in his contract that states he must be released from his contract 5 days after the World Series. When you release a player you cannot bring him back to the franchise until past May 15th. So in other words, if Cespedes can’t agree to a contract extension with the Mets by the end of October he will be elsewhere next season. Even if the Mets wanted to commit to Cespedes long-term they likely would have to severely overpay to prevent him from hitting the free agent market. 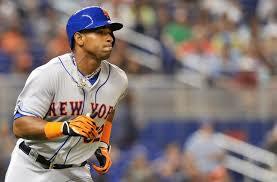 With all that it is highly unlikely that Cespedes is a Met next season. Perhaps with the Mets playing better and getting more fans at Citi Field it will help add needed revenue needed to replace Cespedes in the lineup next season. The front office clearly understands that the club needs a big bat preferably right-handed behind Duda so even if Yoenis isn’t a Met next season expect them to bring in somebody who can drive in runs. That being said, on this website and many others like it we no longer need to talk about the future. The Mets are in win-now mode and a very entertaining division chase with the Washington Nationals. The Mets own one of the better pitching staffs in franchise history and are armed with a lineup that is finally component enough not to drag the arms down. The 9-year playoff drought has a legit chance of ending this season. So enjoy it Met fans, I know I will.